Moses Cone was an American southerner that revolutionized the textile industry in the Gilded Age. He began by selling finished clothing, something that had never really been done before. Born in 1857 in Jonesborough, Tennessee, Moses H. (Herman) Cone was the eldest child of Herman Kahn and Helen Guggenheimer. His parents, whom were German-Jewish immigrants, had a total 13 children! Moses’ father changed his last name from Kahn to Cone when he immigrated in 1940. Herman owned a dry goods store, that began the family’s path to entrepreneurial greatness. Moses and his brother, Caesar, grew up essentially as traveling salesmen for their father’s company. Through his travels for work, Moses met his future wife, Bertha! 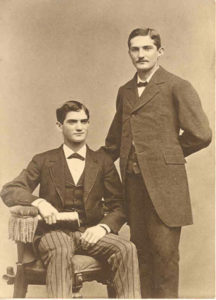 The two were married in 1888 after a 4-year courtship. The Cone Export & Commission soon evolved into the leading manufacturer of denim and supplier to Levi Strauss and Co. The Cone Family became very wealthy from this association, along with other real estate ventures. One of the best investments that Moses Cone ever made, was to the creation of the Watauga Academy. This academy later evolved to become Appalachian State University. Cone’s $500 donation was THE largest donation received in 1899. Sadly, in 1908, due to pulmonary edema, Moses Cone passed away at the age of 51. Bertha lived 39 years longer, and in her husband’s honor, she created a trust for the Moses Cone Health System. This trust built the Moses Cone Hospital in Greensboro, North Carolina. 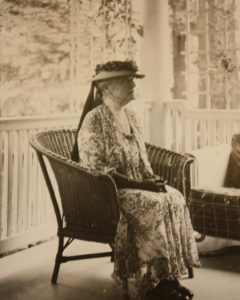 Later, on her death bed in 1947 (and since they never had any children), Bertha donated ~3,500 acres and their Flat Top Manor on the Blue Ridge Parkway to the hospital trust. The hospital in 1950 went on to convey the lands and the estate to the National Park Service, christening it as Moses Cone Memorial Park.